The last male northern white rhino on the planet is on death watch due to an illness, sparking fears the breed is nearing extinction. Sudan, as the rhino is named, became famous after he was listed as Tinder’s “Most Eligible Bachelor in the World,” and is only one of three northern white rhinos left in the world. The elderly animal’s failing health has sparked a crowdfunding effort that has already raised $1 million. According to Fox News, $9 million is needed to save the northern white rhino, a subspecies of the white rhino. 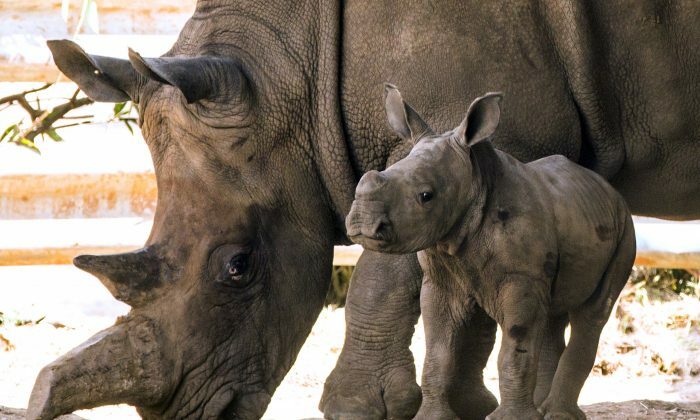 Conservationists said the price tag for saving the species is so high because it would involve in vitro fertilization and multiple surrogate pregnancies in the world’s last two female northern white rhinos. Fatu and Najin, as the two females are called, live at the Ol Pejeta Conservancy in Kenya alongside 45-year-old Sudan, who is considered old in rhino years. Sampere told reporters Sudan was hit with “an uncomfortable age-related infection” in his back right leg and, despite 24-hour treatment, he isn’t getting better. “We are very concerned about him—he’s very old for a rhino, and we don’t want him to suffer unnecessarily,” the conservancy said in a statement. A secondary infection reportedly developed beneath the initial one, and it’s also not responding to treatment. Rhino poaching is a significant problem in Kenya, where the animals have 24-hour security. Poachers are after the horns of the animal, desired for their perceived medicinal value. Horns have been known to fetch as much as several hundred thousand dollars each. The western black rhino went extinct seven years ago due to poaching, and all five remaining rhino species worldwide are considered threatened, according to the conservation group Save the Rhino. Xi Jinping: Presitator for Life?